Winter weather predictions for the 2016-2017 snow season have ranged, but the latest official report from NOAA is that La Niña is unlikely to affect North America this winter. NOAA just released their official climate update for September, and have downgraded the chance for La Niña to occur this season to 40 percent. The latest weather report indicates there's a strong chance that sea surface temperatures will remain in neutral conditions for the foreseeable future, negating the chances for a La Niña to develop. Following last season's super El Niño, NOAA meteorologists had previously forecasted La Niña to occur at a 75 percent chance this winter, but downgraded that and even removed their La Niña tracking site as of Thursday, September 8th. So what does this mean for this upcoming winter? According to meteorologist, Joel Gratz, from the OnTheSnow.com, "La Niña causes a more northern storm track that often brings higher than average snowfall to the northern third of the country and less snow to southern area… The hardest forecast to make is for areas that aren't north or south but right in the middle, like Tahoe, Utah and Colorado. Many La Niña years treat these areas favorably with above average snow, but it's not a sure bet." So as we head into a neutral winter, it's hard to predict where the snow will pile up. You can always check out the Farmer's Almanac and the Old Farmer's Almanac for their winter weather predictions, but for now, it’s best to keep doing your powder dance, we may need all the help we can get. Since the demise of the big 2015-16 El Niño in April, the tropical Pacific has been loitering around in neutral… and now forecasters think it's likely to stay that way through the winter. For now, we're taking down the La Niña Watch, since it no longer looks favorable for La Niña conditions to develop within the next six months. Over the last few months, sea surface temperature anomalies (the departure from the long-term average) in the Niño3.4 region have become more negative, which was expected. Currently, the sea surface temperature in the Nino3.4 region is about -0.5° below the long-term average, according to the ERSSTv4 data. This is the La Niña threshold! 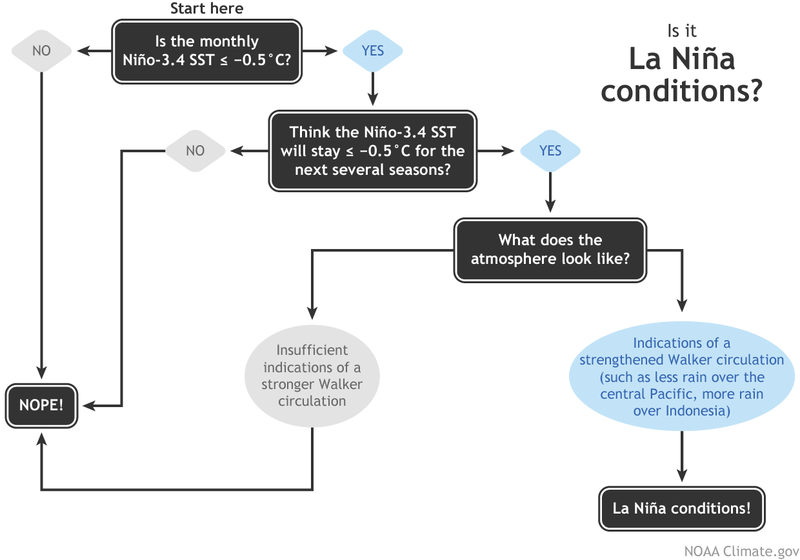 However, the second step of the La Niña conditions decision process is "do you think the SST will stay below the threshold for the next several overlapping seasons?" For now, the answer to this question is "no." In fact, the dynamical climate models are predicting that this month's Niño3.4 index will be the low point, and sea surface temperatures will recover to near average over the next few months. There is still a range of forecasts, but all eight of the North American Multi-Model Ensemble models expect the negative anomalies to weaken toward zero. Check out the Full NOAA report here. It's certainly not impossible that La Niña could still develop; forecasters are putting the chances for La Niña somewhere around 40% through the early winter. And, while a strong La Niña developed immediately after the 1997/98 El Niño, there was nearly a year of slightly-below-average temperatures following the 1982/83 El Niño before a moderate La Niña eventually developed in October of 1984, further evidence that there are many pathways that the climate system can follow after a large El Niño event. For now, though, most signs are pointing toward a stronger chance of remaining in neutral conditions for the time being. Between the model consensus and the current lack of atmospheric response, forecasters put the odds of staying ENSO-Neutral at 55-60%. Of course, we'll continue to keep you posted on all the happenings (and non-happenings) in the tropical Pacific.